Some use it to encompass all non-heterosexual, non-cisgender identities. That’s an understandable use of the term – like I mentioned, I interpret it to be partially about giving space for exploring gender and sexuality, and including so many different groups of people demands that space, demands a challenge to stability. Certainly a wide variety of non-heterosexual, non-cisgender folks are queer. But though queer might cover some part of that spectrum, it is not limited to it. I am not gay nor lesbian nor bisexual nor transgender. I am not anything other than just queer. There are people who some of you might call straight, if you looked at them and their partners and impose genders onto them, but who are actually queer. And many gay, lesbian, and transgender individuals do not identify as queer. Like plenty of the names marginalized people call themselves, queer has a fraught history of reclamation, many controversial political implications, and a universalizing aspect that is too contradictory for some. Adrian Ballou is a Contributing Writer for Everyday Feminism. A genderqueer writer, artist, activist, and educator who does youth development work both inside and outside the classroom, they particularly enjoy writing and facilitating social justice education and youth organizing curriculum. The Trudeau government abused the Charter of Rights and Freedoms by condemning Canadians over and above abuses included in Bill C-51. It is our duty to ensure the elected government is held responsible for the promises. We have many long neglected domestic issues to handle. Remarks below in italic are mine. 1. We will give families more money to help with the high cost of raising their kids. 2. We will give middle class Canadians a tax break, by making taxes more fair. 3. We will cancel income splitting and other tax breaks and benefits for the wealthy. 4. We will invest to create more jobs and better opportunities for young Canadians. 6. We will not end pension income splitting for seniors. 8. We will make post-secondary education more affordable. 9. We will make home care more available, prescription drugs more affordable, and mental health care more accessible. 11. We will invest now in the projects our country needs and the people who can build them. 12. We will invest in public transit to shorten commute times, cut air pollution, strengthen our communities, and grow our economy. 15 We will make the New Building Canada Fund more focused and more transparent. 16. We will make sure that no money intended for investment in communities is allowed to lapse. 18. We will help Canadians get the training they need to find and keep good jobs. 21. We will reinstate a modernized and inclusive fair wages policy for federal procurement. 22. We are strongly committed to supporting and protecting workers’ rights, and as government, we will bargain in good faith with Canada’s public sector unions. 25. We will fix Employment Insurance to better serve Canadians now, and help boost Canada’s economic growth now and in the long-term. 26. We will develop a child care framework that meets the needs of Canadian families, wherever they live. 27. We will do our part to help Canadian children live healthier lives, with less exposure to known health risks. 28. We will introduce a new tax benefit to help teachers and early childhood educators with the cost of school supplies. 29. We will invest in Canada’s North, to help northern Canadians with the high cost of living, and help our northern economies grow. 32. We will disclose Parliamentary expenses and make Parliament open by default. 33. We will protect the integrity of our elections and encourage more Canadians to vote. 34. We will establish an independent commission to organize leaders’ debates. 36. We will restore the voter identification card as an acceptable form of identification. 37. We will also increase penalties so that there are real deterrents for deliberately breaking our election laws. 41. We will not interfere with the work of government watchdogs. 42. We will make the Supreme Court appointment process more transparent. (it doesn’t matter since every Federal and Provincial politician and judge make an Oath of Allegiance to the Queen of England. No Oath is given to Canadians, the Constitution or The Charter of Rights and Freedoms. 43. We will make the Parliamentary Budget Officer truly independent. 46. We will also invest an additional $80 million, over four years, to help the Canada Revenue Agency crack down on tax evaders. 47. We will save home mail delivery. 49. We will involve young people in government. 50. We will consider the gender impacts of the decisions we make. 51. We will deliver easy online access to government services. 54. We will value science and treat scientists with respect. 56. We will make decisions using the best data available and will invest only in programs proven to offer good value. 59. We will fulfill our G20 commitment and phase out subsidies for the fossil fuel industry over the medium-term. 60. We will also work in partnership with the United States and Mexico to develop an ambitious North American clean energy and environmental agreement. 64. We recognize the relationship between Indigenous Peoples and the land, and will respect legal traditions and perspectives on environmental stewardship. 68. We will preserve and promote Canada’s National Parks. 70. We will renew the relationship between Canada and Indigenous Peoples. 71. We will work with First Nations to make sure that every First Nations child receives a quality education. 72. We will provide new funding to help Indigenous communities promote and preserve Indigenous languages and cultures. 73. We will work with the Métis Nation to improve the quality of life for Métis individuals and communities. 74. We will work, on a nation-to-nation basis, with the Métis Nation to advance reconciliation and renew the relationship, based on cooperation, respect for rights, our international obligations, and a commitment to end the status quo. 75. We will work with Métis people, as well as the provinces and territories, to establish a federal claims process that recognizes Métis self-government and resolves outstanding claims. 76. We will also make permanent the funding available to provincial Métis communities for Métis identification and registration, instead of it being available year-to-year. 80. We will enact the recommendations of the Truth and Reconciliation Commission. 81. We will give veterans more compensation, more choice, and more support in planning their financial future. 82. We will honour the service of our veterans and provide new career opportunities through a new Veterans Education Benefit. 83. We will make it easier for veterans to access services, including mental health services. 86. We will repeal the problematic elements of Bill C-51, and introduce new legislation that better balances our collective security with our rights and freedoms. 88. We will take action to get handguns and assault weapons off our streets. 90. We will reverse cuts and make new investments to support our national broadcaster. 93. We will encourage and promote the use of Canada’s official languages. 94. We will offer greater financial security to the families of disabled or deceased public safety officers, and deliver a new plan to address PTSD. 95. We will make it easier for immigrants to build successful lives in Canada, and contribute to the economic success of all Canadians. 96. We will take immediate steps to reopen Canada’s doors, and will make reuniting families a top priority. 100. We will welcome more refugees from Syria to Canada, and offer more help to those providing aid in the region. 101. We will also provide a new contribution of $100 million this fiscal year to the United Nations High Commission for Refugees to support critical relief activities in the region. 102. We will restore Canada’s reputation and help more people in need through a program that is safe, secure, and humane. 103. We will consult with Canadian and international aid organizations to review current policies and funding frameworks that will refocus our aid priorities on poverty reduction. 104. We will renew and repair our relationships with our North American partners. 106. We will restore Canadian leadership in the world. 107. We will recommit to supporting international peace operations with the United Nations, and will make our specialized capabilities, from mobile medical teams to engineering support to aircraft that can carry supplies and personnel, available on a case-by-case basis. 112. We will implement the recommendations made in the Canadian Forces’ Report on Transformation. 115. We will cancel child benefit cheques for millionaires so that we can increase child benefits for the middle class and those working to join it. You can use Facebook, Twitter or your WordPress account to leave a comment. Please refrain from being abusive and offensive. Keep your comments on topic. Posted on February 28, 2016 March 28, 2016 by Dennis CamblyPosted in Canada, Liberal Party, News and politicsTagged activism, Canada, Charter, election, environment, rights, Trudeau. Why do You Believe our Government represents Democracy? As promised in the article before this one here is the rest of the story. Democracy is the basic right to have input before the final draft or decision is made. With the cooperation between the Liberals and New Democrats a Universal Healthcare plan was finalized. Late in the 1960s, Justice Minister Pierre Trudeau, proclaimed “there’s no place for the state in the bedrooms of the nation”. This was the uniquely Canadian classical version of democracy. As I said in the previous article I considered it my right to voice my opposition to war. During the months after the 9/11 attack we heard the attackers were Saudi in origin. Who convinced countries, especially NATO members, to attack Afghanistan and then Iraq? Why didn’t we go to the source and bomb the Saudi Royal Family into oblivion? I wrote in an editorial printed in late January 2003: “I have heard from many of my American friends who are terrified to write anything against the current powers in Washington for fear of their lives. It would be easy to see, for most people, Bin Laden from a wealthy Saudi family is winning the so called terrorist war. After all, he is the professional in the field and it is more and more obvious the voice of reason is being silenced in the United States. Canada is not far behind as new terrorist laws are being put in place…” Many more editorials were written along the same line with one titled Dear Paul aimed directly at Prime Minister Paul Martin Jr. The meetings with Deputy Prime Minister Anne McLellan (and Minister of Justice) turned into shouting matches. She was also the Justice Minister who helped draft up the anti-terrorist legislation. As far as I was concerned she had lost control of her senses. In August 2004 under a lot of stress I went for a bicycle ride in the River Valley. As I moved down into the valley I rounded one of the corners. Someone had put a pile of gravel in the middle of the path. I had been riding the path thousands of times over the years. This time I must have flown over 4 meters (approx 15′) before hitting the pavement flat on my back thankfully wearing a good bicycle helmet. Six ribs were broken, one third of one lung kept me alive, shoulder and collar bones shattered into pieces, bones flew out of my body when I hit the pavement and blood was everywhere. Six days in ICU with a few weeks in the hospital left me feeling out of this world. My businesses were in trouble and so was I. The day I was taken home, there on my desk sat a small cardboard box, full of letters from the government. (one of them claimed I had not reported income from a schooner in Nova Scotia) The new business, supposed to open a few months earlier, was also in financial trouble. On the table was a bill from the City of Edmonton amounting to $300.00 for using an ambulance. 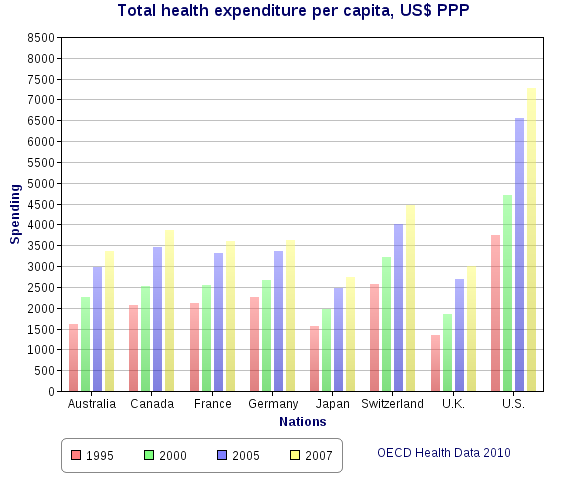 Goodbye Universal Healthcare thanks to the corporations. The all volunteer magazine was kept in print with funds from business supporters and my businesses. No stopping PM Paul Martin from easing up the pressure. On New Years Eve I locked the doors and walked away from two of the businesses. The last print issue of the all volunteer magazine was released in July 2005. We had started an online version in 1994. It remained online with many contributing articles and editorials until 2007. Every time I was hired the job lasted 4-5 weeks. No reason was ever given to me. The letters kept arriving from the federal government. The fine rose to $28,000.00 for not paying the $88.00 on time. My condo was almost paid for with a balance of $42,000.00 and had an appraised value of $225,000.00. Alberta Treasury Bank (ATB), where I had accounts for business plus my mortgage, told me they did not see any reason to assist me as my funds dried up. The same bank was handed $102,000.00 by the Federal Government kangaroo Court. The lawyers told me the only way out was to sell the condo at the appraised value. My mind was in the mood to end my own life. You had to be there to watch friends abandon the ship. The community I helped grow, and spread it’s wings, were long gone. “I, .., do swear that I will be faithful and bear true allegiance to Her Majesty Queen Elizabeth the Second, Queen of Canada, Her Heirs and Successors. So help me God.” Every elected and non-elected Canadian government official, including the judicial system, must swear allegiance to a person in a foreign country. Had I have been there when Benjamin Franklin asked Quebec along with Upper and Lower Canada to join the Union, he would have had a promoter, to rid us of the parasitic monarchy in England. It is my hope you will realize you do not live in a democracy. When Bill C-51 became a big election issue it was the Liberal Party of Canada who supported it under the leadership of PM Justin Trudeau. Now you know why they did so. It allows a government official the right to do whatever they deem necessary, without a warrant, without a charge, without a trial to anyone who disagrees with their policies on any topic. Your elected officials, and not elected bureaucrats, have become your judge and jury. The people are silenced using the same methods used by Stalin in the former Soviet Union. You know what a government can do to the people protesting at the G-20 meeting in Toronto and the Occupy Movement in the United States. Now you have an example of what a Prime Minister can do to an individual without charge, warrant or trial. The Charter of Rights and Freedoms, the US Declaration of Independence or the United Nations Universal Declaration of Human Rights are meaningless words without an honest judicial system. Your rights can and are violated and censored every hour of the day. After World War II the UN Declaration was put in place to grant every citizen freedoms and to prevent wars. Every nation who becomes a member of the UN must sign the Declaration. There are too many examples to list of many nations violating the International Laws agreed too. Why does it happen? The International Criminal Court is ignored due to lack of support from citizens from every country world-wide. Posted on January 18, 2016 May 14, 2017 by Dennis CamblyPosted in Liberal Party, Politics, Trudeau, WarTagged activism, Bill C-51, Canada, Dennis Cambly, Edmonton, gay rights, journalist, politics, rights, times .10 magazne. You are going to hear a story of a covert action taken against a Canadian citizen by the Liberal Party of Canada under PM Paul Martin. He gave orders to do whatever is necessary to destroy or rid Canada of a lone journalist who wrote against the attack on Iraq. The proof needed to avoid the invasion was in the hands of a UN inspector Scott Ritter. He was ignored by the media with two exceptions. Democracy NOW! broadcast several interviews with him and this writer did not believe the crack head in Washington. Did anyone find the WMDs in Iraq? When did the mushroom clouds appear, other than in a delusional mind of an appointed, not elected President of the US? Every so-called journalist in Canada buried their heads in the sand and apparently no one told them to come out. Orders were given directly from PM Paul Martin to shut down a dissenting voice. His cruelty will send shivers down your spine. He wanted disparately to involve Canada in the illegal US invasion and destruction of the Iraqi people. One voice, read by millions, would stop his dream of glory and fame. That same voice would bring the Liberal Party to its knees, with a reported scandal, dropped into the hands of brain dead mainstream media. His attack on me began in early 2002 and continued for four years. Then Deputy Prime Minister, the “Honourable” Anne McLellan his messenger, would threaten me twice. “Stop writing against the illegal invasion of Iraq or suffer the consequences” were her words to me. The same woman I worked tirelessly to have elected in Edmonton Center. She would never have won the election without the full support of the gay and lesbian community. I was the managing editor of its only monthly magazine. You may ask why I did not publish the story during the election last year. It was my desire to see the Liberal Party elected to office and let the people of Canada know what to expect. Frivolous entertainment and nothing more for you the Canadian citizen. A dog gets better treatment than you. For those who believe there is a difference with PM Justin Trudeau in office you are ignis fatuus. The Liberal Party of Canada is rotten to the core. A political group of thieves and liars are now in charge of Canada. Their capacity for deceit, treachery, disloyalty, dishonor and deception is all that remains of a political party lost in its own slime. PM Justin Trudeau is window dressing for the cash donors to the Liberal Party of Canada. Worms are feasting on the remnants. They had the 1957 Nobel Peace Prize winner, PM Lester B. Pearson, as its helm. My rights were replaced with cruel and unusual punishment by the Liberal Party of Canada under orders from the “Right Honourable” PM Paul Martin. Here is a short background to read while you wait for the rest of the story. Posted on January 12, 2016 January 13, 2016 by Dennis CamblyPosted in Canada, media, Politics, TrudeauTagged activism, Canada, liberals, media, paul martin, politics, rights, scandal, Trudeau, war. What If the Rich Didn’t Control Canada’s Media? Get lost hedge funds and oily advertisers, The Tyee is reader-funded. It’s that vision that motivated me, 12 years ago, to found The Tyee. People said real journalism was too expensive to be reader-supported. And that no readers would provide money to a website they could read for free. People said I was naive and, yes, deluded. Some days I was tempted to agree. But I don’t feel that way today. I believe that The Tyee can continue to pay for hard-hitting reporting and employ a top notch staff, because there is no point in creating independent media if it deprives skilled, committed journalists of paid work. Posted on December 3, 2015 by Dennis CamblyPosted in Canada, Education, media, News and politicsTagged activism, Canada, independent, media, politics, resources. How do you know the news you are watching is fact based or fiction? The media use words such as: it is reported, expert says, we have been told and other similar phrases are clues to the deception. Rarely, if ever, do the media have evidence before reporting to you. If you were arrested by the police and held without a reason how would you feel? Our media puts you in a singular view without telling you, why or where, they get the facts. This documentary takes you into the world of the media lies. In Canada, why has the media turned a blind eye, to at least 159 Conservative wrong doings in the election 2015 coverage? Miguel Francis-Santiago began his journey into the Ukrainian Crisis with a trip to Crimea. His latest investigative film takes him home to New York, to begin his quest to understand how the crisis came about, who was behind it and where it might lead in the future. “Twenty-first-century warfare is now as much about words, pictures and video as guns, missiles and bombs. Meeting with American and European journalists, Miguel explores how crises in Ukraine and elsewhere are reported around the world. Headlines and sound bites have the power to shape public opinion. Sensationalism, censorship by omission and even falsified news; some claim there are no longer any taboos on the information battlefield. The programme explores what governs media agendas in covering international news where unwritten editorial and geopolitical goals dictate how (and what) information is disseminated. What sources or news outlets can be trusted? We live in a connected age when the saying, information is power, has never been more true. Note: Text in quotes from the description of the documentary. A Federal election is normally held every 4 years in Canada. Unlike the United States Canadians do not vote for the Prime Minister. The person who gets the top job in Ottawa is elected by his or her political Party as the leader. Today Stephen Harper the leader of the Conservative Party, much akin to the Republican Party in many ways is the Prime Minister of Canada. In each Riding one person needs to be elected by a majority of the people. In Canada we officially have a Liberal, Conservative, New Democrat, Bloc Québécois and Green Party. There are over a dozen smaller political parties, plus a person can run in a Federal Election, as an Independent. We call these elected officials our MP for Member of Parliament known as the House of Commons. These Members of Parliament are considered the Lower House, and in comparison, are similar to the U.S. Congress. The next group is the Upper Chamber, called The Senate, and are appointed by the Prime Minister without any support of vote by Canadians. Canada is based on a 14th Century style of government, with a touch of the Feudal system, for good measure. Canadians are saddled with an unelected bureaucracy at the Federal level to the Provincial, down to the City, County and Towns, along with thousands of Commissions. (the commissions link is simply to show search results) The number of people employed full and part time is near 1.5 million for a population of 34 million citizens. When added together the cost to Canadians takes up 30% of the annual budget for salaries and lucrative pensions. 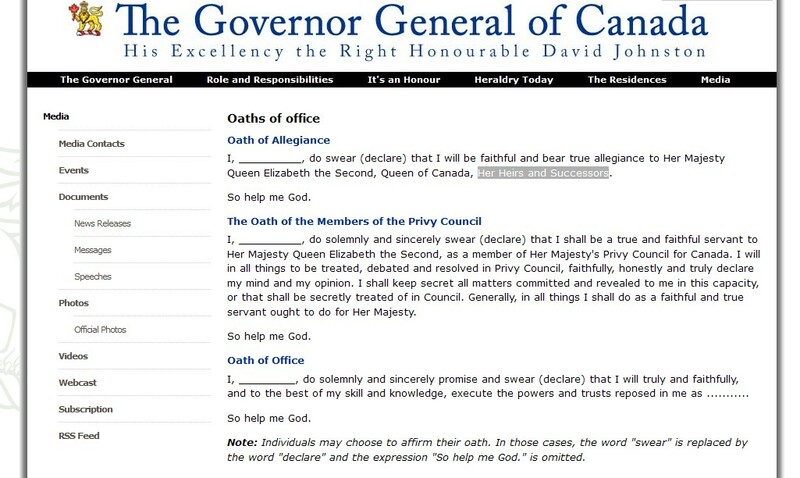 To show you how 14th Century Canada truly is, you need to look no further than the Oath of Allegiance, made by our political and judicial members. An Oath is sacred to most, and in the majority of nations, political leaders promise to uphold the Constitution of their country. In doing so they also promise under Oath to represent the people. Take another look at the CIA website for an unbiased description of the various levels of government. The link for the Annual Budget is from a source I usually do not use, however, in this case it is the most accurate available. Canada is often criticized for the cost of our Universal Health Care system by the uninformed right wingers in the United States. The cost is 3% of the Annual Budget to cover every person living in Canada to have Health Care coverage. Yes the system does have some problems, although no Canadian ever had to declare bankruptcy or die, while waiting to see a Doctor. Costs such as prescriptions are often paid for or partially covered depending on various circumstances. Everything written here today is meant as a backgrounder to upcoming blogs and videos. The Occupy movement is strong in most of Canada, along with protests, on environmental and electoral issues. Posted on April 19, 2012 March 20, 2016 by Dennis CamblyPosted in Canada, News and politicsTagged activism, Canada, Canadian, election, fraud, Harper, occupy, protests, robocalls.